Katherine, every inch the daughter of the formidable Ferdinand and Isabella of Castile, read out a protest which made it clear that she distrusted the impartiality of both the legates and Cardinal Wolsey; she made a formal appeal to the pope that the case be heard in Rome. Then, perhaps recognizing the impact of a dramatic gesture, she fell to her knees before her husband and swore that she had been his lawful and faithful wife for twenty years. Impasse. I was thinking of all this when I recently visited the Apothecaries Hall, home of the Worshipful Society of Apothecaries and built on the site of that same Blackfriars Priory. 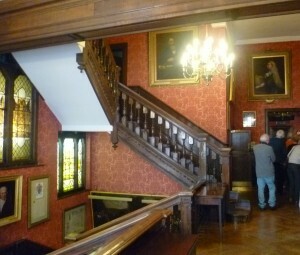 We were shown the Court Room where, tradition had it, Katherine had appealed to Rome on that fateful day in June 1529. 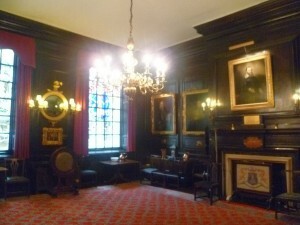 Of course, it wasn’t really the same room – the original Apothecaries Hall had burnt down in the Great Fire of 1666 and was rebuilt in 1671. But it occupied the same footprint. I was perhaps standing in the same space where Katherine had once stood to defend herself. I have no idea if Katherine’s ghost haunts the Court Room but is an imposing place with its dark panelling, stained-glass windows and pictures of worthy men in heavy gilt frames. It was not difficult to imagine Katherine in that sombre atmosphere. 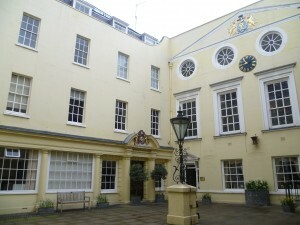 As I came out of the Apothecaries Hall and walked across its elegant 18th century courtyard into the spring sunshine, I thought about Katherine. 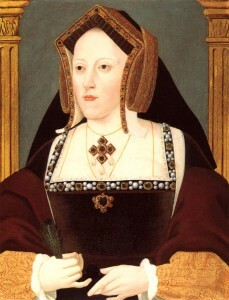 In her youth, she had been a political pawn on the royal marriage market; she had borne Henry at least five children, of whom only Mary had survived; Henry had forcibly divorced her, parted her from her daughter, and forced her to live in penury and obscurity for the rest of her life. I felt for her. From what I have read – Henry may have been charismatic, but he doesn’t seem a very nice person at all. Although he did bequeath modern England some amazing ruined abbeys. I feel for poor Catherine. Bad enough to be married off as a political pawn… but to such a man! Like you, I tend to look for the ghosts in lovely old buildings. Such stories they would have to tell. Personally, I think Henry became a monster. He may have left us some beautiful ruined abbeys, but in so doing he destroyed a lot of art. Most churches had wonderful wall paintings and they all went – well, not quite all, the church at Pickering in Yorkshire is covered in the most amazing wall paintings.